ONE is a female former teenage guerrilla fighter who became President Robert Mugabe’s closest ally, the other is a battle-hardened, male opposition leader often dismissed as a busted flush. But, despite their differences, Joice Mujuru and Morgan Tsvangirai are in talks to lead a united opposition alliance to try to unseat Mugabe in Zimbabwe’s much-anticipated election next year. The president, 93 and increasingly frail, has vowed to stand again to extend his rule, which began in 1980 and has been dominated by economic collapse and political repression. His Zanu-PF party has a stranglehold on government, the civil service and military, and has a record of election interference and voter intimidation that presents a formidable obstacle for any challenger. Zimbabwe’s history of violent and fraud-riddled elections has eroded public trust in voting, but the coalition leaders hope a unified alternative to Mugabe will produce a high turnout that will make it harder to rig the result. Tsvangirai, leader of the Movement for Democratic Change (MDC) party, knows first-hand the dangers of tangling with Mugabe’s regime. Since emerging as an anti-government trade unionist in the 1980s, he has often been targeted by the security forces and was brutally assaulted by police in 2007. He won the most votes in the first-round of the 2008 presidential elections, but poll officials said it was not enough to avoid a run-off against Mugabe. As Zanu-PF loyalists unleashed a wave of violence, Tsvangirai pulled out of the race and became prime minister in a power-sharing government in which he was widely seen as being out-manoeuvred by Mugabe. Many of Tsvangirai’s supporters and anti-Mugabe activists view Mujuru as an untrustworthy opposition voice. She served for 34 years as a loyal Zanu-PF minister and was a favourite to succeed Mugabe. As a youth, she fought in the war against colonial rule and was famed for shooting down an enemy helicopter. But in 2014 she was ousted as the country’s vice-president in a purge when Mugabe’s wife Grace accused her of plotting a coup. Having formed the new National People’s Party, 62-year-old Mujuru may draw some support from former Zanu-PF voters, women, the business community — and even disgruntled members of the military. The potential of a united opposition was underlined in Gambia’s election last year when rivals came together to defeat long-time dictator Yahya Jammeh. A new opposition alliance is also planning to fight in Kenya’s August poll. The Zimbabwean coalition made significant progress last month by signing up Welshman Ncube, who led a group that split from Tsvangirai’s MDC. Similar deals are in the works with the People’s Democratic Party, led by the respected former finance minister Tendai Biti, as well as with more than a dozen smaller parties. 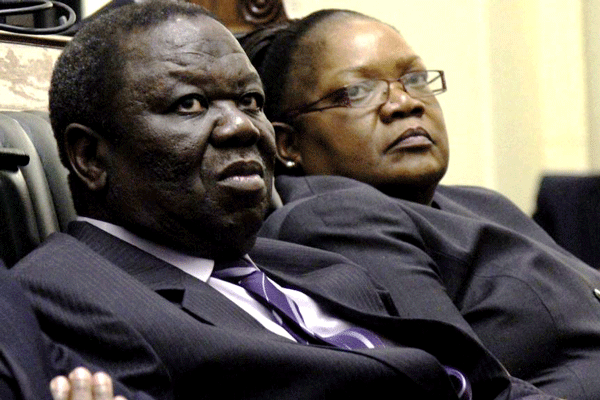 Tsvangirai, who is recovering from cancer, appears set to be the coalition’s presidential candidate — with Mujuru likely to offer him her full support. But critics say his political sway is too narrow to build a truly broad anti-Mugabe movement that would include churches, civil action groups and radical activists behind last year’s surge of street protests.